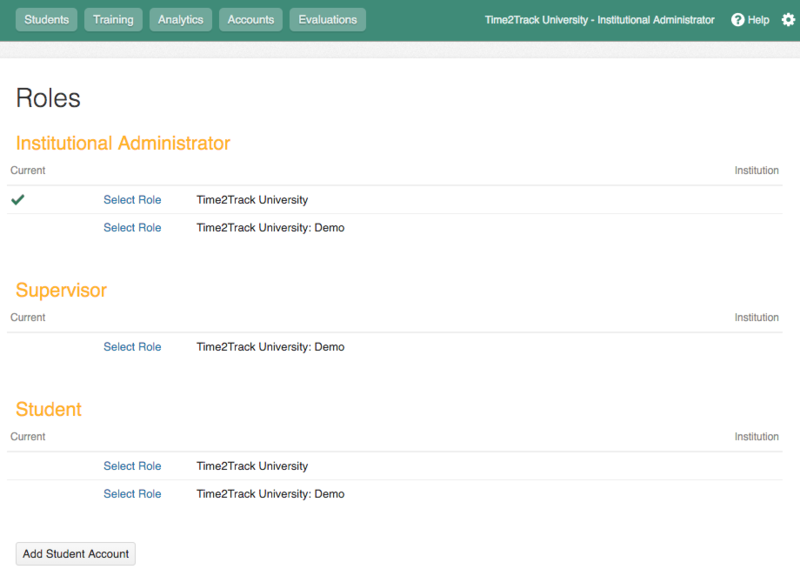 As an Institutional Administrator, you have the ability to add a "Demo" student account so you can see what your trainees will see when they use Time2Track. Click the gear icon in your Time2Track account, then click Switch Roles. Choose a Program Start Date (this is a required field in Time2Track, but the date here will not affect anything for you) and a Program Level (choose the same level as your students). Click Select Role next to the student account you just created, and you've now switched to using your demo student account. To switch back to your Institutional Administrator account, click the gear icon, then Switch Roles, then click Select Role next to your Institutional Administrator role.